Its hard to believe we have been back from Montana for over a week already. 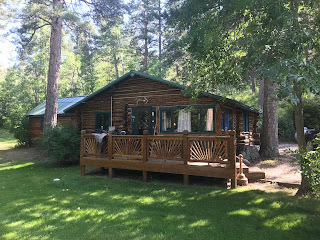 We started the trip this year up on the Missouri River where we rented a cabin that was up in a canyon just outside of Deerborn. There were only three of us this year and the 1933 two-room cabin was just fine nestled away up on Oak Creek where the neighbors kept a couple of wolves for pets. The weather when we arrived that first afternoon was hot and dry, with barely a breeze. The river level was higher than we normally see this time of the year thanks to a good winter snow pack and frequent spring rains in the upper watershed. After unpacking we headed up river to a spot we like that's a short drive up from the Wolf Creek bridge. Paul and Steve went down river, and I decided to work up the left bank where being a right handed caster I could work my way up and the hit bank side risers. Trout sit right very close to the edge here as the high, steep bank offers protection and there is deep, dark water just a short swim to the right if they do feel threatened. I waded up the bank slowly where a fish rose steadily to what appeared to be pale evening duns. The caddis, flavs and spinners that were also in the drift were ignored, so I tied a #16 PED cripple to the end of my 5X tippet off a leader that was roughly 15 feet long. 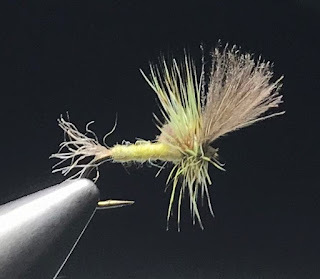 After I made a couple of short test casts to my right to make sure my leader and fly were doing what i wanted, I cast the fly about a foot and a half just to the right of where the fish was rising and as it came within its sight, it lifted its nose and took my offering. 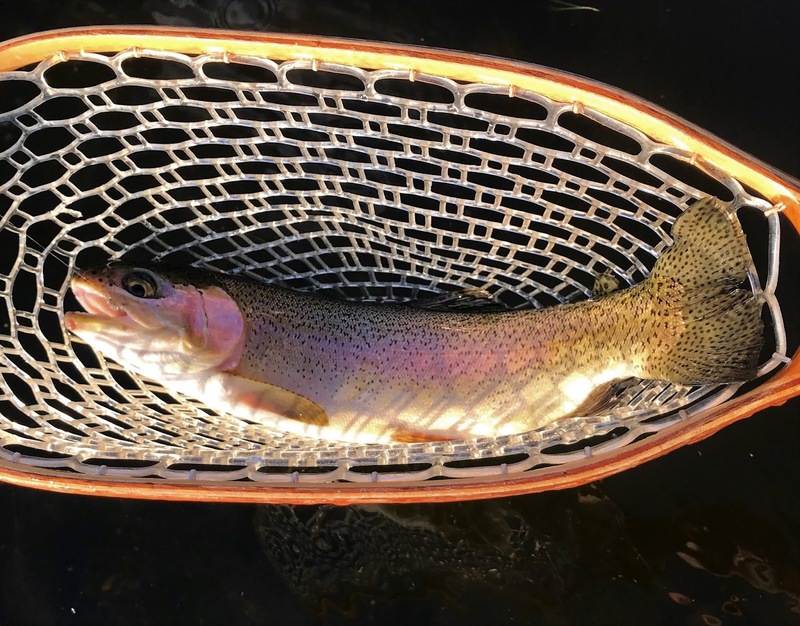 After a spirited battle I netted a nice 17-18 inch rainbow. 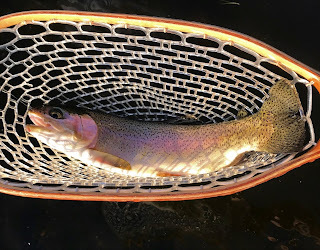 Before the sun dropped below the mountains I took a couple of more smaller rainbows on the same cripple and then headed back to the car as I couldn't see my fly and what it was doing. It was a good start to the trip. 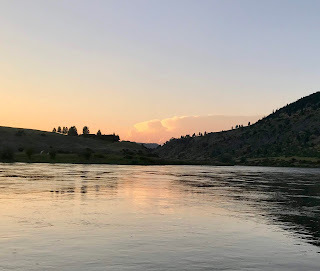 The next day we rented a drift boat and put in below Holter dam where a carousel of a dozen boats with guides and their clients took turns fishing the long eddy just off the boat ramp. In the short time we were there we saw lots of bent rods and happy fishermen as they fished nymphs off of bright indicators in the deep, cold currents fed by the dam. We weren't interested in fishing nymphs, so we headed down river where tricos filled the air and fish rose to them as they dropped from the sky. When the river is higher than normal as it was then, the first half mile of river below the dam is covered with eddies and seams that constantly change direction, which made it near impossible to get a good drift to any of the hundreds of trout rising to fallen trico spinners, even from a drift boat. We kept moving and soon reached a riffle that had rising fish and was about mid-thigh in depth, so we anchored the boat and spread out below the working trout. By now the pale morning duns had started to rise and the fish were taking them. The wind had also picked up, blowing upstream which made it fairly easy to get our flies on the working fish. We took a few nice fish, browns that moved quickly to take my sparkle dun, and then the wind kicked up a notch and the bugs disappeared and with that, the fish stopped as well. To make a long day short, that was it for the day. By noon the wind was blowing a constant 25+ mph straight up river. The river actually had white caps where the current was strong, and casting was next to impossible. It took 5 hours to row to Craig, with Paul doing the lions share, and me finishing up the last mile or so. If we stopped rowing, the boat would get pushed upstream. The next couple of days we wade fished, and did fairly well, with a few nice fish taken along with many 12-15 inch fish when the weather cooperated. The hatches during the day were sporadic, and we often had to take cover from fierce thunder storms and heavy rains that book-ended brief bright, sun filled skies. It was a mixed bag as is often said. The last hour of light each day did bring good hatches of caddis and with that plenty of targets along the banks to cast to with some good fish landed to round out the day. All things considered, it was an enjoyable few days on the Mighty Mo. Rainbow taken on an Iris Caddis as the sun was setting. 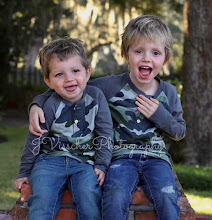 Nice story. But you would think that the author of the "Caddis Chronicles" would fish one occasionally. I just returned from Craig and the Corn Fed Caddis was the ticket for evening goodness.